Cambau E, Williams DL. 25 January 2019, posting date. Anti-leprosy drugs: Modes of action and mechanisms of resistance in Mycobacterium leprae. In Scollard DM, Gillis TP (ed), International textbook of leprosy. www.internationaltextbookofleprosy.org. Dr Cambau has held a consultancy for Hain Lifesciences and for Fondation Raoul Follereau. She also received a grant from Ordre de Malte France. Although the implementation of long-term dapsone therapy made the effective treatment of leprosy possible , within a few decades resistance to this antibiotic was observed among patients undergoing treatment . This resistance resulted in high rates of relapse, primarily due to inappropriate monotherapy (secondary resistance). As a consequence, dapsone-resistant leprosy was transmitted to susceptible persons, resulting in new cases of dapsone-resistant leprosy (primary resistance) . New drugs were subsequently identified as effective anti-leprosy drugs; however, acquired resistance to these drugs was also observed when they were used as a monotherapy , . Consequently, a strategy developed for the treatment of tuberculosis  was implemented, in which multiple effective antibiotics were combined to prevent the selection of antibiotic-resistant strains. The multi-drug therapy (MDT) recommended in 1982 by the World Health Organization (WHO) as the standard treatment for leprosy is a combination of dapsone, rifampin, and clofazimine . MDT has been effective at reducing both the prevalence and the incidence of leprosy (see Chapter 1.1; Chapter 1.2) at a global level , . However, drug resistance is still observed . Approximately 211,973 new cases of leprosy were reported in 2015, demonstrating that the battle against leprosy continues and that research in chemotherapy must continue . In this review, we describe the antibacterial activity of the antibiotics used to treat leprosy and, if known, their mechanisms of resistance in M. leprae. We also describe the methods used to study antibiotic activity, drug susceptibility, and resistance, and report on the efforts to monitor global drug resistance in leprosy . 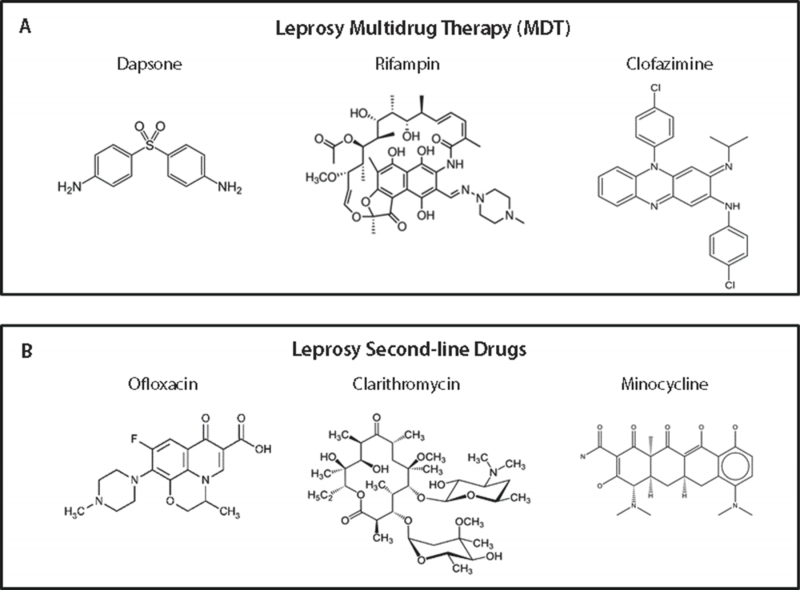 This discussion begins with the anti-leprosy drugs included in the standard WHO-recommended MDT treatment of leprosy: dapsone, rifampin, and clofazimine. Next, a number of newer antimicrobial agents that possess various degrees of bactericidal activity against M. leprae, such as the fluoroquinolones, the macrolides, and the tetracyclines, are discussed. These drugs have been described as effective in experimental infections in mice and in human clinical trials. The modes of action for most of the effective classes of drugs against M. leprae occur at the level of nucleic acid and protein synthesis. However, for many anti-leprosy drugs, the actual mechanisms of action are not known but inferred from studies of M. tuberculosis. The first effective treatment for leprosy was promin, a sodium glucosulfone (diamino-azobenzene 4’-sulfonamide) introduced in 1943 . Six years later, a more effective oral sulfone, dapsone (4,4’-diaminodiphenylsulfone) (Figure 1A), replaced promin and is still a fundamental component of MDT for leprosy. 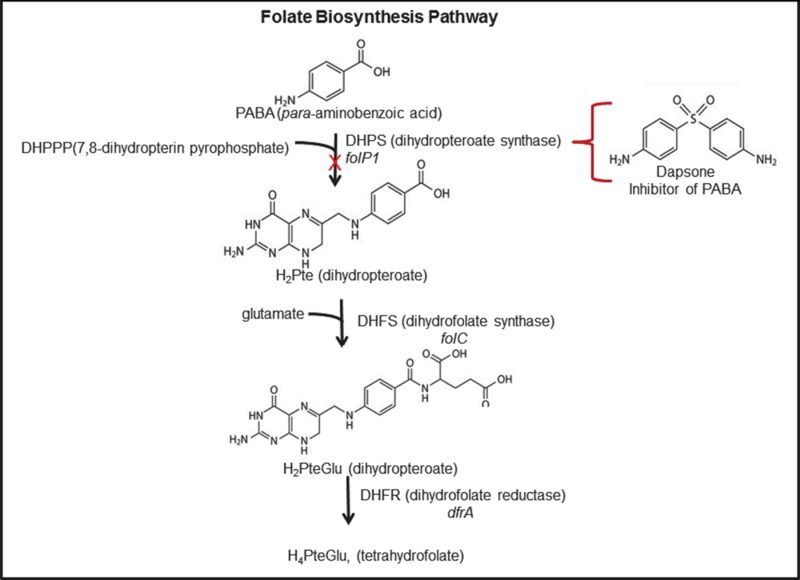 Sulfone drugs target the dihydropteroate synthase (DHPS), a key enzyme in the folate biosynthesis pathway in bacteria (Figure 2), by acting as a competitive inhibitor of p-aminobenzoic acid (PABA) , . The inability to synthesize folate leads to a depletion of adenosine, guanosine, and thymidine pools. The effect of dapsone on folate biosynthesis has been confirmed in M. leprae , . Dapsone is a competitive inhibitor of para-amino benzoic acid (PABA), a critical substrate for folate biosynthesis. Dapsone blocks the condensation of PABA and 7,8-dyhydro-6-hydroxymethylpterin-pyrophosphate from forming 7,8-dihydrofolic acid. The key enzyme in this step is the dihydropteroate synthase (DHPS) encoded by the folP gene. Dapsone competitively inhibits this condensation and ultimately results in the decreased production of tetrahydrofolate, an essential component of nucleic acid biosynthesis in M. leprae. Dapsone has been shown to be effective in inhibiting the multiplication of M. leprae in the mouse experimental model and in humans , , . The minimum inhibitory dose in mice was 0.0001%, producing a serum minimum inhibitory concentration (MIC) of 0.01 µg/ml . Unfortunately, dapsone’s strong bacteriostasis of M. leprae produces little or no bactericidal activity . Rifampin, a rifamycin derivative, (3-(4-methyl-1-piperazinyl)-imino-methylrifamycin) (Figure 1A) is the key bactericidal component of the WHO-recommended MDT for leprosy treatment . The target of rifampin in bacteria is the β-subunit of the DNA-dependent RNA polymerase (composed of an α-subunit dimer, a β-subunit, a β´-subunit, and a ω-subunit)  (Figure 3). Rifampin interrupts the binding of the β-subunit with DNA, which uncouples the production of mRNA and results in the death of the organism. Rifampin has demonstrated rapid M. leprae bactericidal activity in mice and in humans, resulting in no detectable live bacilli after one month of treatment , . The minimum inhibiting dosage in mice is 0.01%–0.001% (2 to 5 mg/kg) in the mouse diet, producing a serum MIC of 0.3 µg/ml . In humans, a single dose of 1,200 mg can reduce the number of viable bacilli in a patient’s skin to undetectable levels within a few days. Rifapentine, another rifamycin derivative with a long half-life (>14 h), has been shown to be slightly more active than rifampin ,  in mice. A single dose (10 mg/kg) of rifapentine killed 99.6% of the bacilli, while the same dose of rifampin killed 92.1% of the bacilli . Clofazimine [3-(p-chloroanilino)-10-(p-chlorophenyl)-2,10-dihydro-2-(isopropylimino) phenazine] (Figure 1A) is a lipophilic riminophenazine compound that possesses antimycobacterial activities , ; however, the mechanism has not been fully elucidated. Clofazimine is highly lipophilic and appears to bind strongly to mycobacterial DNA . The binding of the drug to DNA appears to occur principally at base sequences containing guanine, which may explain clofazimine’s preference for the G+C-rich genomes of mycobacteria over human DNA. The accumulation of lysophospholipids (detergent-like agents with membrane-disruptive properties in bacterial cells) appears to mediate the antibacterial activity of clofazimine in some gram-positive bacteria . It is unclear whether this mechanism of action is also operational in M. leprae. Clofazimine has been proven to be weakly bactericidal against M. leprae in the mouse model, but some clinical improvement was observed during treatment of patients , . Although clofazimine is not suitable as a single drug therapy for leprosy, it has been used successfully as a combination therapy in the MDT for leprosy. Fluoroquinolones were tested against M. leprae after having shown inhibitory activity and clinical efficacy against M. tuberculosis . Their mode of action is to inhibit type II topoisomerases, leading to DNA double-strand breaks and replication inhibition  (Figure 4). Whereas most bacteria harbor two type-II topoisomerases, DNA gyrase and topoisomerase IV, M. tuberculosis and M. leprae do not appear to possess the latter. Consequently, in M. leprae and M. tuberculosis, the target of fluoroquinolones is the DNA gyrase, a tetramer composed of two A-subunits (GyrA) and two B-subunits (GyrB). Fluoroquinolones have been shown to inhibit the M. leprae DNA gyrase at concentrations similar to those necessary to inhibit the M. tuberculosis gyrase . FIG 4 Inhibition of DNA Gyrase by Ofloxacin. Courtesy of Professor Alexandra Aubry. The DNA gyrase, a tetramer composed of two A-subunits (GyrA) and two B-subunits (GyrB), functions to convert positive-coiled DNA into negative-coiled DNA so that replication can proceed. When quinolones bind to the mycobacterial DNA gyrase holoenzyme, double-strand breaks occur in the DNA and replication is inhibited. Ofloxacin is a fluorinated carboxyquinolone (Figure 1B). The active isomer is the levorotatory form and thus is 50% of the drug weight in ofloxacin and 100% in levofloxacin. Although sparfloxacin showed a 5-fold higher bactericidal activity than ofloxacin against M. leprae in mice, the side effects in humans made it unacceptable for treatment . Moxifloxacin had the best activity of any of the fluoroquinolones tested against M. leprae in mice . In addition, moxifloxacin has powerful bactericidal activity, virtually identical to that of rifampin, in humans , , . Although other new fluoroquinolones (sitafloxacin, garenoxacin) have shown good activity against M. leprae , moxifloxacin is the only new fluoroquinolone commercially available with activity against M. leprae superior to that of ofloxacin and levofloxacin. Clarithromycin is a semisynthetic macrolide that differs from erythromycin in its methyl substitution at the number 6 position of the macrolide ring  (Figure 1B). The methyl substitution confers good antibacterial activity and fewer side effects. It is the only macrolide that displays significant bactericidal activity against M. leprae, with an estimated MIC of 0.12 µg/ml in mouse experiments , , . Clarithromycin has also been shown to be bactericidal in humans, where the daily administration of 500 mg of clarithromycin killed 99% of viable M. leprae within 28 days and 99.9% by 56 days , . Although the mechanism of action against M. leprae is unknown, it is thought to be similar to that of macrolides in other bacteria. Clarithromycin inhibits protein synthesis through binding to the 50S subunit of the mycobacterial ribosome, targeting the 23S rRNA in particular . Minocycline (7-dimethylamino-6-demethyl-6-deoxytetracycline) (Figure 1B) is the only member of the tetracycline group of antibiotics to demonstrate significant activity against M. leprae, presumably due to its lipophilic nature, which may enhance cell wall penetration . The mechanism of action of minocycline against M. leprae has not been demonstrated but is thought to be similar to that of other members of this class (tetracyclines), which act by inhibiting protein synthesis. Specifically, tetracyclines bind reversibly to the 30S ribosomal subunit, blocking the binding of aminoacyl-tRNA to the 16S rRNA-ribosome complex . Minocycline is bactericidal for M. leprae and the activity is dose dependent, with an MIC estimated at 0.2 µg/ml , . Minocycline has shown an additive effect when combined with dapsone and rifampin and when combined with clarithromycin . This effect was confirmed in humans when minocycline and clarithromycin were given either in a single dose or in multiple doses , . Minocycline has also shown good companion drug activity when combined with ofloxacin, especially in the rifampin + ofloxacin + minocycline (ROM) combination , or with another fluoroquinolone, in the rifapentine + moxifloxacin + minocycline (PMM) combination . Thioamides (ethionamide and prothionamide) are drugs with anti-tuberculosis activity . These drugs inhibit fatty acid synthesis (enoyl-ACP-reductase). Although the mechanism of action has not been characterized in M. leprae, the efficacy of thioamides in humans has made them possible alternative drugs for leprosy . Overall, the activity of prothionamide (500 mg/day) against M. leprae was similar to that of dapsone and clofazimine, but worse than that of rifampin, minocycline, clarithromycin, or ofloxacin . Several other drugs found to have anti-leprosy properties in mice have not been utilized in humans for various reasons, such as an excessive cost-benefit ratio, unacceptable side effects or toxicity, or the absence of any advantage over the effective agents already used. For example, aminoglycosides (streptomycin and kanamycin) are bactericidal for M. leprae ; however, they are not suitable for the long-term treatment of leprosy because they must be administered parenterally. Fusidic acid, although effective in mice, is only weakly bactericidal in humans . Beta-lactams combined with beta-lactamase inhibitors, cycloserine, and lincosamides were tested in the mouse model ,  but did not show significant activity or good pharmacokinetics for human use , , , . Regardless, a few of these drugs may be useful as alternative drugs in the case of resistance. Bedaquiline (TMC-207 or R207910), which was developed for the treatment of multidrug-resistant tuberculosis, is the first compound of the quinoline class with activity against mycobacteria . It has demonstrated significant bactericidal activity against M. leprae in mice , . However, to date, no human trials have been conducted to further advance bedaquiline for human use against leprosy. Further studies on its potential usefulness as an anti-leprosy agent are needed. Linezolid belongs to the new class of oxazolidinones that inhibit protein synthesis. Linezolid is weakly bactericidal against M. leprae in mice , . PA-824 (pretonamid) is a new nitroimidazole that is effective against M. tuberculosis, acting as a prodrug that must be activated by a bacterial nitroreductase. Although this drug has shown very good anti-tuberculosis activity, it has exhibited low activity against M. leprae . This low activity is likely due to the lack of a M. leprae homolog of Rv3547 that encodes the specific nitroreductase necessary for activation . Epiroprim is an inhibitor of dihydrofolate reductase. It comes from a family of drugs that acts synergistically with dihydropteroate synthase inhibitors such as in trimetoprim-sulfamethoxazole, which inhibits folate biosynthesis. Epiroprim was tested against M. leprae alone and in combination with dapsone in mice . Alone, it was less active than dapsone, but a synergistic effect was apparent when it was used in combination with dapsone, and the synergism was maintained against a dapsone-resistant strain of M. leprae. Rifampin is more bactericidal than dapsone or clofazimine in the current WHO-recommended MDT used to treat leprosy. Some of the second-line anti-leprosy drugs are bactericidal for M. leprae. Clarithromycin and minocycline have bactericidal activity, although less than that of rifampin, and thioamides (ethionamide) are less effective. Among the new drugs, rifapentine and moxifloxacin appear slightly more active than the other antibacterial compounds in their class (rifampin and ofloxacin, respectively). Bedaquiline efficacy in humans needs to be demonstrated. Long-term monotherapy with dapsone ultimately led to treatment failures with the emergence of dapsone-resistant strains of M. leprae in the 1960s , . This situation presented serious problems for leprosy control efforts, as resistance levels rose to as high as 40% in some areas of the world , . By the mid-1970s, it was clear that life-long dapsone monotherapy was failing. Between the 1960s and 1970s, additional antimicrobial agents, such as rifampin and clofazimine, were introduced for treating leprosy. However, when rifampin was administered alone to treat dapsone-resistant leprosy, it led to the rapid development of rifampin-resistant organisms . As in M. tuberculosis, drug resistance in M. leprae is most often attributable to mutations in chromosomal genes encoding drug targets. These mutations occur spontaneously because of errors in DNA replication. Noncompliance or inadequate therapy, especially for multibacillary leprosy (MB) patients, has the potential to enrich the subpopulations of drug-resistant M. leprae, leading to the spread of one or more resistant phenotypes. Because M. leprae cannot be cultivated in vitro, the frequency of drug-resistant mutants in a population of bacteria is estimated from studies of M. tuberculosis and from the results of experimental and clinical studies. The frequency of dapsone-resistant mutants in a population of M. leprae is estimated to be 106 and those of rifampin and ofloxacin resistance 107 and 108, respectively. The frequency of clofazimine resistance in M. leprae is unknown but appears to be extremely low. Since untreated MB patients can harbor large bacterial loads (1011 to 1012 M. leprae cells), it is feasible that a patient could contain up to 105 dapsone-resistant organisms and thousands of rifampin- or ofloxacin-resistant mutants in their tissues , . Recognizing that dihydropteroate synthase (DHPS) is the target of sulfonamides and derivatives, including dapsone , studies designed to characterize the mechanism of dapsone resistance in M. leprae have relied upon direct sequencing of the two genes encoding DHPS1 and DHPS2 (folP1 and folP2, respectively) from dapsone-susceptible and -resistant M. leprae isolates. Missense mutations were found within codons 53 and 55 of folP1 (Figure 5) in dapsone-resistant mutants , . Because no mutations were identified in the DHPS2 genes from the resistant mutant, folP2 was ruled out as a functional part of dapsone resistance . Mutations identified in the dapsone-resistant mutant resulted in a DHPS1 enzyme with decreased dapsone binding . Since the same mutations were repeatedly observed in codons 53 and 55 of the folP1 gene in characterized dapsone-resistant strains, this region was designated the “drug resistance-determining region” (DRDR) for dapsone resistance  (Table 1). A search for folP1 mutations in M. leprae isolates demonstrated that all M. leprae strains with high-level dapsone resistance (multiplication in mice fed with 0.01% dapsone), and the majority of M. leprae strains with moderate-level dapsone resistance (multiplication in mice fed with 0.001% dapsone) contained missense mutations within codons 53 and 55 , , . One isolate with low-level resistance (multiplication in mice fed with 0.0001% dapsone but no higher concentrations) also contained a mutation in codon 55 . 1 R = resistant in mouse footpad assay. NC = not confirmed in mouse footpad assay. 2 Amino acid substitution in drug target protein; Mutant amino acids in bold and italics are high frequency mutations for M. leprae drug resistance. FIG 5 Partial DNA Sequence of the (A) Dapsone (folP1), (B) Rifampin (rpoB), and (C) Ofloxacin (gyrA) DRDRs of Thai-53, a Drug-Susceptible Strain of M. leprae. 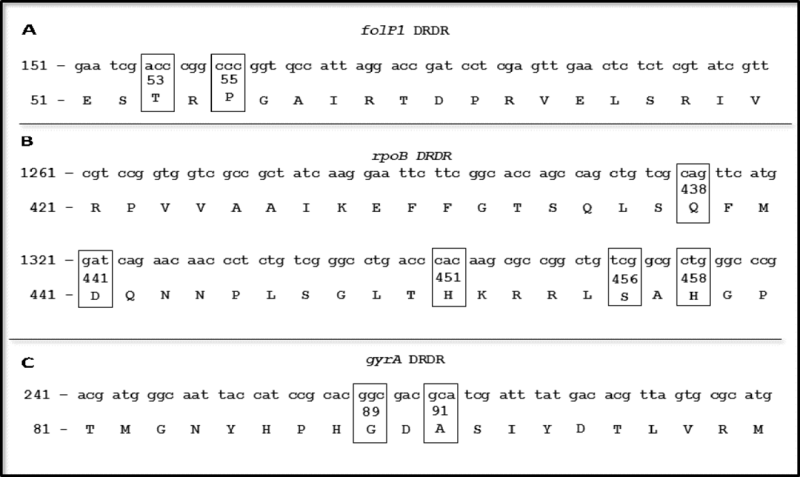 The codons are shown in lowercase letters and the corresponding amino acids are capitalized. The main codons involved in resistance are shown in boxes. The numbering system used is Mycobacterium leprae TN genome strain NT (EMBL/GenBank/DDBJ entry AL450380_2). To further characterize dapsone resistance in M. leprae, the effect of dapsone on recombinant M. smegmatis expressing M. leprae folP1 mutant genes was investigated . In this model, mutations Thr53Ala, Thr53Ile, Pro55Arg, and Pro55Leu conferred an 8- to 16-fold increase in the dapsone MIC , . The Pro55Leu mutation is the most frequent mutation observed with dapsone resistance in leprosy (Table 1). M. tuberculosis resistance to rifampin correlates with changes in the structure of the β-subunit of the RNA polymerase. These changes are due primarily to missense mutations that occur within a highly conserved region of the rpoB gene, referred to as the “rpoB DRDR”. Rifampin resistance in M. leprae also correlates with missense mutations within the rpoB DRDR , . The numbering systems used for reporting these mutations in M. tuberculosis and in M. leprae are different and have caused confusion in the literature. The confusion stems from the fact that rpoB mutations reported for M. tuberculosis use the Escherichia coli numbering system for codon substitutions. For M. leprae, the first descriptions of mutations used the first numbering system described for the M. leprae gene , , where the codon Ser425 corresponds to Ser531 position in E. coli . Further confusion occurred when the whole genome sequence of M. leprae (Tamil Nadu strain, TN) was annotated . Now the β-subunit of RNA polymerase in the M. leprae rpoB numbering system shows Ser456 corresponding to the former Ser425 (Figure 5) , . Substitutions within codons Ser456 and His451 (latest annotation) of the rpoB DRDR have been shown to be the most frequent mutations associated with the development of the rifampin-resistant phenotype. These mutations have been characterized in the MFP drug susceptibility assay (Table 1). Although other low frequency mutations have also been described, not all of them have been confirmed by MFP (Table 1). 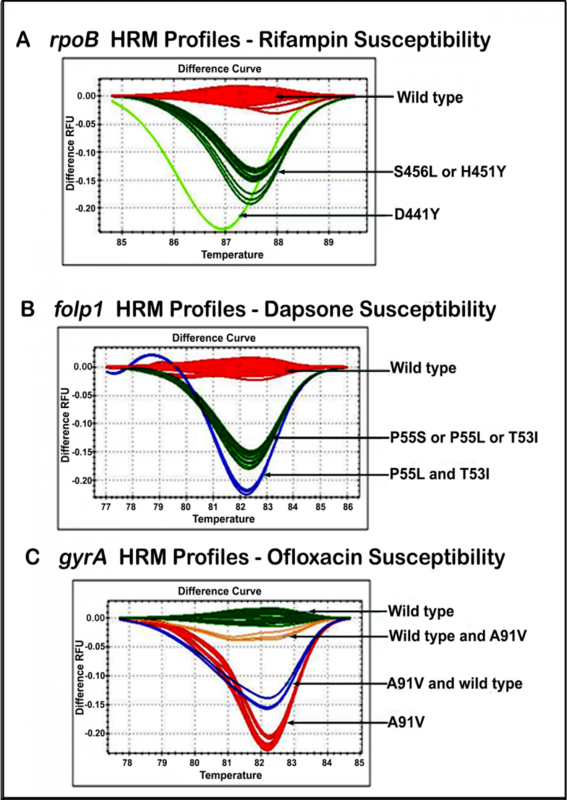 Mutations within a highly conserved region of gyrA (gyrA DRDR) have been associated with the development of ofloxacin resistance in most resistant strains of M. tuberculosis , as well as in other bacteria . The DRDR of M. leprae gyrA is highly homologous to that of M. tuberculosis, and missense mutations within codons 89 and 91 have been found in ofloxacin-resistant strains of M. leprae (Table 1). The substitution Ala91Val is the most frequent mutation associated with the development of the ofloxacin-resistant phenotype in M. leprae , , , . It has been suggested that gyrB mutations can also cause quinolone resistance ; however, this claim has yet to be substantiated in patient isolates. Some quinolones, such as garenoxacin, may have another mechanism of action because they demonstrate activity in vitro and in the mouse model against ofloxacin-resistant strains harboring mutation at either the 89 or 91 codon , . The mechanism of clarithromycin resistance in M. leprae has not been studied. In other mycobacteria, resistance appears to be due to a decrease in drug binding to ribosomes and is associated mainly with missense mutations within the 23S rRNA gene or mutations in ribosomal proteins , . A general survey of 104 bacterial index-positive leprosy patients in Korea identified no mutations associated with the clarithromycin-resistant genotype (23S rRNA) that is found in other resistant mycobacteria. The molecular mechanism of minocycline resistance has not been studied in M. leprae. However, resistance to minocycline in M. leprae may be similar to chromosomally mediated mechanisms of tetracycline resistance described in other organisms, mainly mutations in the 16S rRNA . Clofazimine is a riminophenazine drug that was developed as an anti-tuberculosis agent in the 1950s. Recently, mutations in the Rv0678 gene, which encodes a transcription repressor of efflux pump MmpS5-MmpL5, causing overexpression of this efflux pump, were found to result in M. tuberculosis cross-resistance to both clofazimine and bedaquiline (TMC207) , . However, the M. leprae genome has no functional MmpS5-MmpL5 efflux pump and no homolog of Rv0678 (https://mycobrowser.epfl.ch/). A recent report identified two new genes—Rv1979c, encoding a probable permease, and Rv2535c, encoding a probable cytoplasmic peptidase (PepQ)—associated with clofazimine resistance in M. tuberculosis mutants . Although M. leprae possesses homologs for these genes in its genome (ML1974 and ML0521, respectively), their association with clofazimine resistance in M. leprae remains unclear. Leprosy presents a very special problem for detecting drug resistance because M. leprae cannot be cultured axenically. Accordingly, determining M. leprae’s susceptibility to anti-leprosy drugs was not possible until Shepard developed the mouse footpad assay (MFP) . Since its development, the MFP assay has been the ‘gold standard’ for leprosy drug susceptibility testing. This method requires the recovery of a sufficient number of viable bacilli from a patient to inoculate the footpads of 20 mice (if testing a single drug), with each footpad receiving a bacterial load of 5x103. Infected mice are treated with the appropriate drug and are sacrificed after a defined period of time (usually 6, 9, or 12 months, according to the positive growth in control mice). The effect of the drug is assessed by counting the number of bacilli in the footpads of treated mice and comparing that to the number of bacilli harvested from untreated mice. The strain is considered susceptible if bacterial multiplication is observed only in untreated mice and not in drug-treated mice. The strain is considered drug-resistant if growth is observed in one or more drug-treated mice . The MFP method is the only bacteriological assay for drug susceptibility testing of M. leprae and presently is the standard for characterizing the association of mutations in target genes with drug resistance in M. leprae. While the MFP gives definitive information pertaining to the susceptibility of an M. leprae isolate to anti-leprosy drugs, it is laborious, expensive, and often fails due to the need for significant numbers of viable M. leprae in a patient’s biopsy. Because of the special resources needed to conduct this assay, only a few facilities in the world have retained high-quality mouse footpad laboratories. Their support is critical, as new drug-resistant mutants may evolve requiring corroboration in this model. The only in vitro phenotypic-based assays for assessing resistance in M. leprae use radiorespirometry techniques (BACTEC and Buddemeyer). The basis of these radiorespirometric assays is the detection of 14-CO2 produced by M. leprae through the metabolism of 14-C-labeled palmitic acid in 7H12 medium in the presence and the absence of anti-leprosy drugs. These methods have been used to screen for new anti-leprosy drugs . However, the use of these techniques for drug susceptibility testing in leprosy biopsies is limited by a stringent requirement for very large numbers (2x107) of viable bacteria from a patient and by the use of radioactivity, often restricted in many countries. Moreover, the commercial BACTEC 460TB apparatus used for this purpose is no longer available from the manufacturer. Over the past three decades, rapid DNA-based assays have been developed for detecting drug-resistant M. leprae directly from clinical specimens. Even though these assays have been based on molecular techniques, many reference laboratories in leprosy-endemic countries have the capability of utilizing some of these tools for detecting drug resistance. The introduction of DNA fragment amplification technology using polymerase chain reaction (PCR), as well as advances in the study of the molecular biology of mycobacteria, have played significant roles in the identification of gene targets for drugs used to treat leprosy and tuberculosis. Advances have included the sequencing and annotation of large segments of the M. leprae genome ,  and the eventual completion of the M. leprae  and M. tuberculosis genome projects . In addition, an improved understanding of the genetic basis of drug resistance in mycobacteria, especially in M. tuberculosis, led to the identification of chromosomal mutations involved in the development of M. leprae drug resistance. This advance led to the development of molecular methods for the detection of mutations associated with dapsone, rifampin, and fluoroquinolone (ofloxacin) resistance in M. leprae. All current molecular methods for drug susceptibility testing of M. leprae are based on PCR amplification of M. leprae DRDRs (folP1, rpoB, or gyrA) (Figure 6A) for subsequent mutation detection in specific codons. Procedures have been developed for the detection of resistance directly from crude biological specimens (e.g., skin biopsy specimens, slit-skin smears, or formalin-fixed paraffin-embedded tissues). These procedures rely on cell-wall disruption by simple freeze/thaw or enzyme-based processes, followed or not by DNA purification using either conventional DNA extraction methods or column-based DNA purification methods as discussed below . FIG 6 Drug Susceptibility Testing of M. leprae by PCR-DNA Sequencing. Courtesy of Dr. Masanori Matsuoka. Agarose gel electrophoresis of amplicons generated by multiplex PCR of drug resistance determining regions (DRDR) of folP1 (dapsone), rpoB (rifampin), and gyrA (ofloxacin) from M. leprae DNA obtained from skin biopsies and a 100-bp DNA ladder (far right lane). Partial DRDR DNA sequence chromatograms from Thai-53, a drug-susceptible strain of M. leprae, demonstrating wild-type codons (circled in red) in which mutations may occur and lead to the development of resistance. Alignment of partial DRDR DNA sequences of representative drug-susceptible (top strand) and drug-resistant M. leprae strains (bottom strand for each drug). Codons associated with resistance are numbered using Mycobacterium leprae TN genome strain (EMBL/GenBank/DDBJ entry AL450380_2) numbering system: S456L mutant contains a TCG→TTG mutation in rpoB codon 456, substituting a leucine for a serine amino acid residue in the β-subunit protein; P55L mutant contains a CCC→CTC mutation in folP1 codon 55, substituting a leucine for a proline amino acid residue in the DHPS protein; and A91V mutant contains a GCA→GTA mutation in gyrA codon 91, substituting a valine for an alanine amino acid residue in the GyrA protein. PCR-DNA sequencing was first used to identify genetic mutations associated with dapsone , , rifampin , , and fluoroquinolone resistance  in MFP-characterized M. leprae drug-resistant mutants that were obtained from relapsed patients. These studies demonstrated that specific mutations within the M. leprae DRDRs of folP1, rpoB, and gyrA of drug-resistant mutants were associated with drug-resistant phenotypes (Table 1). In 2008, the WHO recommended guidelines for global surveillance of drug-resistant M. leprae using PCR-DNA sequencing . The protocols for multiplex PCR amplification of the three drug target genes were modified  (Figure 6A). All three drug target gene sequences of a drug-susceptible strain of M. leprae are depicted in Figure 6B. The alignments of the target gene sequences from this drug-susceptible strain with those of rifampin-, dapsone-, and ofloxacin-resistant strains of M. leprae demonstrate the most frequently detected mutations associated with rifampin, dapsone, and ofloxacin resistance, respectively, in leprosy patients (Figure 6C). As DNA sequencing has become routine in more laboratories around the world, it has become the ‘Molecular Gold Standard’ for drug susceptibility testing for leprosy. However, DNA sequencing methodologies are not commonly available in low-resource laboratories. Therefore, other assays have been developed for assessing the molecular drug susceptibility of M. leprae. To enable wider implementation of molecular drug susceptibility analyses in leprosy, a novel, ‘single-tube’, Real-Time PCR (qPCR)-high resolution melt (HRM) assay for anti-leprosy drug susceptibility testing was developed . The qPCR-HRM assay is based on the amplification of the DRDRs of folP1, rpoB, and gyrA and a simple post-PCR step to exploit thermal characteristics of the amplicons for the detection of sequence variants. As the amplicons are subjected to high temperatures, the DNA duplex becomes single-stranded and each strand has a different melting temperature due to the specific ATCG sequence, referred to as a “melt”. The wild-type (WT) (drug-susceptible) and variant (V) (drug-resistant) DRDR DNA fragments generate distinct melting curves (HRM profiles). All steps of this assay are performed in a single well using a real-time PCR instrument and results are obtained using HRM analysis software. A strong correlation between the qPCR-HRM assay and PCR-DNA sequencing results has been demonstrated , . HRM profiles (displayed as difference curves) for high-frequency mutations commonly associated with drug resistance in M. leprae can be distinguished from those of wild-type profiles (Figure 7A, 7B; Table 2). qPCR-HRM drug susceptibility analysis has also aided in recognizing samples with mixed or minor alleles in the gyrA  (Figure 7C). The authors concluded that the qPCR-HRM drug susceptibility test for M. leprae is a simple, rapid, and high-throughput tool for the routine screening of new and relapsed cases. FIG 7 Drug Susceptibility Testing of M. leprae by RT-PCR High Resolution Melt (HRM). HRM profiles for rifampin-susceptible (wild-type, red) and rifampin drug-resistant M. leprae strains (green) containing rpoB mutations resulting in an altered β-subunit of the RNA polymerase. S456L contains a TCG→TTG mutation in codon 456, substituting a leucine for a serine amino acid residue; H451Y contains a CAC→TAC mutation in codon 451, substituting a tyrosine for a histidine residue; and D441Y contains a GAT→TAT mutation in codon 441, substituting a tyrosine for an aspartic acid residue. HRM profiles for dapsone-susceptible (wild-type, red) and dapsone-resistant M. leprae strains (green and blue, respectively) containing folP1 mutations resulting in an altered dihydropteroate synthase enzyme. P55S contains a CCC→TCC mutation in codon 55, substituting a serine for a proline amino acid residue; P55L contains a CCC→CTC mutation in codon 55, substituting a leucine for a proline amino acid residue; and T53I contains a ACC→ATC mutation in codon 53, substituting an isoleucine for a threonine amino acid residue. P55L and T53I (blue) contain both folP1 mutations in the same strain. HRM profiles for ofloxacin-susceptible (wild-type, green) and ofloxacin-resistant M. leprae strains containing gyrA mutations resulting in an altered GyrA subunit of the DNA gyrase. A91V (red) contains a GCA→GTA mutation in codon 91, substituting a valine for an alanine amino acid residue, and A91V plus wild-type (blue and yellow) contain mixed infections of the mutant and wild-type genes. The numbering system used is M. leprae TN genome strain NT (EMBL/GenBank/DDBJ entry AL450380_2). 1 DRDR = drug resistance determining region of M. leprae; folP1 (dapsone), rpoB (rifampin), and gyrA (ofloxacin). 2 HRM profile = qPCR-High Resolution Melt drug susceptibility profile of DRDR of M. leprae; folP1 for dapsone, rpoB for rifampin, and gyrA for ofloxacin susceptibility. WT = wild-type, consistent with the drug-susceptible phenotype; V = HRM variant, consistent with the drug-resistant phenotype. 3 Drug-resistant mutation from DNA sequencing of DRDR from drug-resistant strains of M. leprae, e.g., T(ACC)53I(ATC) = a missense mutation has occurred in codon 53 of the folP1 gene resulting in the substitution of an isoleucine (I) amino acid residue for a threonine (T) residue in the encoded dihydopteroate synthase protein of this M. leprae strain. WT = DNA sequence of DRDR has no mutations and therefore sequence is consistent with drug-susceptible M. leprae. 4 This specimen contains a mixed infection: WT (drug-susceptible) and V (drug-resistant) M. leprae containing folP1 with missense mutations in codon 55 and 53. 5 This specimen contains a mixed infection: WT (drug-susceptible) and V (drug-resistant) M. leprae containing a gyrA with a missense mutation in codon 91. 6 This specimen has 3 missense mutations in the DRDR of the rpoB. DNA array technology has been exploited to develop a reverse hybridization method for leprosy drug susceptibility testing (LDS-DA) . This assay detects mutations in the genome of M. leprae that confer resistance to key drugs (rifampin, dapsone, and ofloxacin) for leprosy. Briefly, this assay is performed using multiplex PCR to amplify the DRDRs of target genes in bacterial DNA drawn from clinical specimens. The assay simultaneously labels the amplicons with biotin. The amplicons are then hybridized to the LDS-DA slide containing a series of bound oligonucleotide probes corresponding to each mutation in the folP1, rpoB, and gyrA genes (Figure 8A). Biotin-labeled DNA fragments hybridize to the capture probes on the LDS-DA and are detected by an avidin-biotin horseradish peroxidase reaction. The readout is colorimetric (Figure 8B). FIG 8 Leprosy Drug Susceptibility Testing by DNA Array (LDS-DA). Modified from Figures 1b and 3 with the permission of Dr. Masanori Matsuoka (Matsuoka M, et al. 2008. A novel method for simple detection of mutations conferring drug resistance in Mycobacterium leprae, based on a DNA microarray, and its applicability in developing countries. J Med Microbiol 57(10):1213-1219). Schematic representation of the array of oligonucleotides on the DNA array. Black circles represent spots with biotin as landmarks for conjugate reaction control; grey circles are the wild-type (drug-susceptible) spots; and white circles are the drug-resistant mutant spots. The region with oligonucleotides designated FW-(folP1 wild-type) and FM-(folP1 mutant) is for dapsone-resistance detection (the dapsone field). The region designated GW-(gyrA wild-type) and GM-(gyrA mutant) is the ofloxacin field. The region designated GP-(Positive control) and GN-(Negative control) constitutes the control field and the region designated RW-(rpoB wild-type) and RM-(rpoB mutant) is the rifampin field. Results obtained by the LDS-DA. Thai-53 (M. leprae drug-susceptible strain). 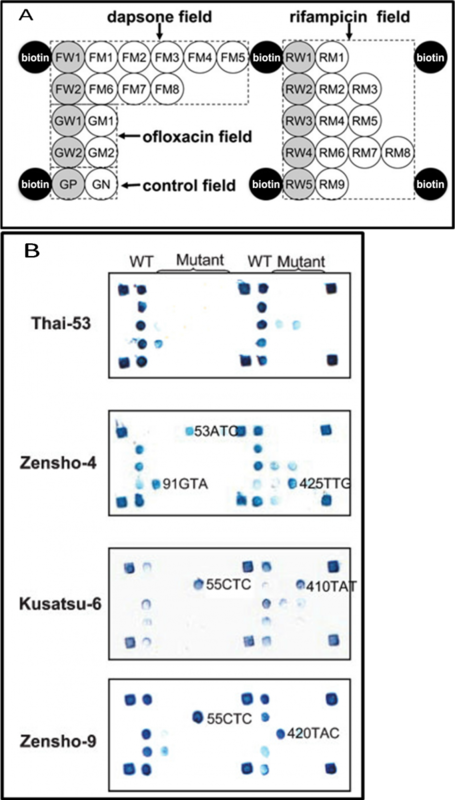 Zensho-4 is a dapsone-, rifampin-, and ofloxacin-resistant strain containing an ACC→ATC mutation in codon 53 of folP1, a TCG→TTG mutation in codon 425 (now the codon 456) of rpoB, and a GCA→GTA mutation in codon 91 of gyrA. Kusatsu-6 is a dapsone- and rifampin-resistant strain containing a CCC→CTC mutation in codon 55 of folP1 and a GAT→TAT at codon 410 (441) in rpoB. Zensho-9 is a dapsone- and rifampin-resistant strain containing a CCC→CTC in codon 55 of folP1 and a CAC→TAC in codon 420 (now the codon 451) in rpoB. The numbering system used is Mycobacterium leprae TN genome strain NT (EMBL/GenBank/DDBJ entry AL45030_2. Feasibility studies were conducted to evaluate the performance of the LDS-DA in Myanmar, Indonesia, and the Philippines . The results of the LDS-DA analysis of 305 isolates showed a high correlation with the results of PCR-DNA sequencing. Therefore, the LDS-DA is a rapid method for simultaneously testing the drug susceptibility of two of the three first-line drugs for leprosy, along with ofloxacin, a second-line drug for leprosy. The DNA-strip test GenoType® Leprae-DR (Hain Lifescience, Nehren, Germany) is the only commercially available kit that permits the simultaneous detection of M. leprae and its resistance to rifampin, dapsone, and ofloxacin . This test uses a reverse hybridization method similar to the DNA array described above, except that the oligonucleotide probes are pre-hybridized onto a nitrocellulose strip (Figure 9). 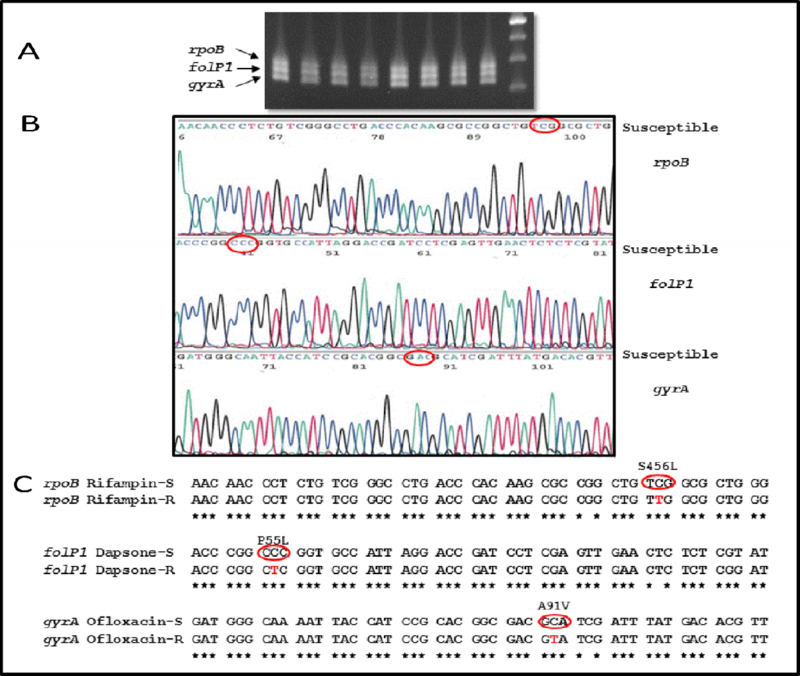 FIG 9 Mutations Conferring Resistance in Mycobacterium leprae Detected by the GenoType® LepraeDR DNA Strip Test . Lanes 1 and 2 are negative controls with only the CC band highlighted. Lane 3 shows a rifampin-resistant strain containing a S456L rpoB mutant allele and wild-type gyrA and folP1 alleles. Lane 4 shows a dapsone-resistant strain containing a T53I folP1 mutant allele and wild-type rpoB and gyrA alleles. Lane 5 shows a rifampin- and dapsone-resistant strain containing S456L rpoB and T53I folP1 mutant alleles and gyrA wild-type alleles. Lane 6 shows a rifampin-resistant strain containing a modification of rpoB sequence between 438-441 codons and wild-type gyrA and folP1 alleles. Lane 7 shows a dapsone-resistant strain containing a P55L folP1 mutant allele and wild-type rpoB and gyrA alleles. Lane 8 shows a rifampin-, ofloxacin-, and dapsone-resistant strain containing S456L rpoB, A91V gyrA, and P55L folP1 mutant alleles. Lanes 9–10 show dapsone-resistant strains containing a P55L folP1 mutant allele and wild-type rpoB and gyrA alleles. Lanes 11–12 show a rifampin-resistant strain containing a S456L rpoB mutant allele and wild-type gyrA and folP1 alleles. Lane 13 shows the Marker lane (M) for probes. Abbreviations: CC = labeling control; UC = universal control (mycobacterial 16S rRNA hybridization control); ML = hybridization control specific for M. leprae DNA; rpoB, gyrA, and folP1 = hybridization controls for other regions of these genes not associated with resistance; rpoB WT1-4, gyrA WT, and folp1 WT = wild-type DRDRs from susceptible M. leprae strains; rpoB MUT1-2, gyrA MUT, and folP1 MUT = mutant DRDRs from drug-resistant M. leprae strains. The numbering system used is Mycobacterium leprae TN genome strain (EMBL/GenBank/DDBJ entry AL450380_2). DNA is extracted without purification. DRDRs of M. leprae target genes are amplified by multiplex PCR. Single-stranded amplicons are bound to the complementary analogue probes during hybridization with the DNA strip of specific mutant and wild-type probes. Unbound amplicons are removed by washing. A conjugate reaction is performed during which bound amplicons are marked with the enzyme alkaline phosphatase. Wild-type and mutant DRDRs are then made visible in a colorimetric detection reaction. Typical results are shown in Figure 9. A feasibility study was conducted to determine the effectiveness of this assay for detecting antibiotic-resistant M. leprae. Among the 91 M. leprae strains analyzed, 14 were resistant to rifampin, 18 were resistant to dapsone, and one strain was resistant to ofloxacin . The GenoType® LepraeDR assay was 100% concordant with DNA sequencing and the MFP assay for DRDRs, encoding most of the major mutations in rpoB, folP1, and gyrA. It also detected a mix of wild-type and mutated alleles. Two of the susceptible strains, as determined by DNA sequencing and MFP assays for rifampin, had discordant GenoType® LepraeDR results. This discord was due to the presence of mutations within a codon in the strains that do not induce rifampin resistance in M. leprae and one silent mutation. The authors concluded that the test is easy to perform and highly specific for the detection of drug resistance in leprosy. Information gained from drug resistance testing will become an integral component of an overall public health strategy for better patient care. In addition, that information can provide monitoring of the spread of drug-resistant M. leprae. In 2008, the WHO Global Leprosy Program (GLP) initiated a Sentinel Surveillance Network to monitor the development of drug resistance, with a particular emphasis on rifampin, the main component of MDT , . The GLP organized a network of clinicians, program managers, and reference laboratories to test leprosy cases for antibiotic resistance. The initial focus was on monitoring relapse cases. From 2008–2010, 1065 cases of relapse were identified in eight participating countries (Table 3). One-third of these cases were included in molecular drug resistance studies. Of these, PCR-DNA sequencing results were obtained from 217 cases. Dapsone resistance was identified in 29 cases (13%), 16 (7%) were rifampin-resistant, and two (1%) were ofloxacin-resistant (Table 3). The majority of the strains resistant to rifampin were also resistant to dapsone, and the two strains resistant to ofloxacin were multi-drug resistant (i.e., also resistant to dapsone and rifampin) , , . From 2011 on, new cases were also studied for resistance. The first results of this sentinel WHO surveillance were recently published. The inclusion of new cases allowed for the description of unexpected primary resistance to ofloxacin (gyrA mutation) and mono-resistance to rifampin in several countries . Since the surveillance of resistance is now part of the global WHO strategy against leprosy, more countries will participate in future surveillance studies . It will be possible to formulate an accurate view of drug-resistant leprosy and, thereby, assess the success of current control strategies. This assessment will be a key factor in monitoring MDT effectiveness and preventing the spread of drug resistance. 1 PCR-DNA sequencing of drug resistance determining regions of folP1 (dapsone), rpoB (rifampin), and gyrA (ofloxacin) completed. Source: Data compiled from WHO Weekly Epidemiology Records for leprosy , . The global use of an effective short-course MDT for leprosy has resulted in the “elimination” (<1 case/10,000 population) of leprosy as a public health problem in many countries around the world. However, resistance to dapsone and rifampin, two of the most powerful components of the current MDT, are observed in most parts of the world. Multiple factors contribute to the continued emergence and spread of M. leprae drug resistance, particularly in countries of high endemicity. These factors include unsupervised treatment, resulting in a potential lack of compliance or irregular drug use, and the lack of attention paid to leprosy in countries that overuse antimicrobial agents. Even though some of the resistant strains emerged prior to the era of MDT, the above factors have also contributed to the drug-resistant leprosy cases observed during the MDT era. Between 1960 and 1990, resistance was detected using the cumbersome, expensive, and time-intensive mouse footpad assay. However, an understanding of the mode of action of anti-leprosy drugs and of the mechanisms of resistance in M. leprae has contributed to the development of molecular-based drug susceptibility assays that can be performed directly on clinical specimens. The availability of these tools has made it possible for the development of a WHO surveillance network to study global drug resistance in leprosy. Expanded global leprosy drug resistance surveillance has shown that, although overall resistance rates appear to be low, several single- and multi-drug-resistant M. leprae strains are reported annually in both MDT relapse cases and new cases. Together, these observations strongly suggest that efforts for drug resistance surveillance in leprosy must be further expanded to ensure the continued effectiveness of the current MDT for leprosy control , . ^ Lowe J. 1950. Treatment of leprosy with diamino-diphenyl sulphone by mouth. Lancet 1:145–150. a, b Pearson J, Rees R, Waters M. 1975. Sulfone resistance in leprosy. A review of 100 proven clinical cases. Lancet 2:69–72. ^ Pearson JM, Haile GS, Rees RJ. 1977. Primary dapsone-resistant leprosy. Lepr Rev 48:129–132. ^ Jacobson RR, Hastings RC. 1976. Rifampin-resistant leprosy. Lancet 2:1304–1305. a, b, c, d Cambau E, Perani E, Guillemin I, Jamet P, Ji B. 1997. Multidrug-resistance to dapsone, rifampicin, and ofloxacin in Mycobacterium leprae. Lancet 349:103–104. ^ Cohn ML, Middlebrook G, Russell WF, Jr. 1959. Combined drug treatment of tuberculosis. I. Prevention of emergence of mutant populations of tubercle bacilli resistant to both streptomycin and isoniazid in vitro. J Clin Invest 38:1349–1355. a, b, c WHO. 1982. Chemotherapy of leprosy for control programmes. World Health Organization, Geneva. a, b Ji BH. 1985. Drug resistance in leprosy—a review. Lepr Rev 56:265–278. ^ WHO. 2013. Global leprosy: update on the 2012 situation. Weekly Epidem Record 88:365–380. a, b WHO. 2011. Surveillance of drug resistance in leprosy. Weekly Epidem Record 23:233–240. a, b, c WHO. 2016. Global leprosy Strategy 2016–2020 “Accelerating towards a leprosy-free world”. Regional Office for South-East Asia, Delhi, India. a, b, c WHO. 2017. A guide for surveillance of antimicrobial resistance in leprosy: 2017 update. World Health Organization, Delhi. ^ Faget G, Pogge R, Johansen F. 1943. The promin treatment of leprosy: a progress report. Publ Hlth Rept 58:1729. ^ Richey DP, Brown GM. 1969. The biosynthesis of folic acid. IX. Purification and properties of the enzymes required for the formation of dihydropteroic acid. J Biol Chem 244:1582–1592. ^ Seydel JK, Richter M, Wempe E. 1980. Mechanism of action of the folate blocker diaminodiphenylsulfone (dapsone, DDS) studied in E. coli cell-free enzyme extracts in comparison to sulfonamides (SA). Int J Lepr Other Mycobact Dis 48:18–29. ^ Kulkarni VM, Seydel JK. 1983. Inhibitory activity and mode of action of diaminodiphenylsulfone in cell-free folate-synthesizing systems prepared from Mycobacterium lufu and Mycobacterium leprae. A comparison. Chemotherapy 29:58–67. a, b, c, d, e, f, g Williams DL, Spring L, Harris E, Roche P, Gillis TP. 2000. Dihydropteroate synthase of Mycobacterium leprae and dapsone resistance. Antimicrob Agents Chemother 44:1530–1537. ^ Shepard C, Tolentino J, McRae D. 1968. The therapeutic effect of 4-4’-diacetyldiaminodiphenylsulfone (DADDS) in leprosy. Am J Trop Med Hyg 17:192–201. a, b Ji B. 1985. Drug susceptibility testing of Mycobacterium leprae. International Journal of Leprosy 55:830–835. ^ Shepard CC. 1962. Multiplication of Mycobacterium leprae in the foot-pad of the mouse. Int J Lepr 30:291–306. a, b, c Holmes IB, Hilson GR. 1972. The effect of rifampicin and dapsone on experimental Mycobacterium leprae infections: minimum inhibitory concentrations and bactericidal action. J Med Microbiol 5:251–261. ^ Jin DJ, Gross CA. 1988. Mapping and sequencing of mutations in the Escherichia coli rpoB gene that lead to rifampicin resistance. J Mol Biol 202:45–58. ^ Rees RJ, Pearson JM, Waters MF. 1970. Experimental and clinical studies on rifampicin in treatment of leprosy. Br Med J 1:89–92. ^ Levy L, Shepard CC, Fasal P. 1976. The bactericidal effect of rifampicin on M. leprae in man: a) single doses of 600, 900 and 1200 mg; and b) daily doses of 300 mg. Int J Lepr Other Mycobact Dis 44:183–187. a, b, c Consigny S, Bentoucha A, Bonnafous P, Grosset J, Ji B. 2000. Bactericidal activities of HMR 3647, moxifloxacin, and rifapentine against Mycobacterium leprae in mice. Antimicrob Agents Chemother 44:2919–2921. ^ Pattyn SR. 1987. Rifabutin and rifapentine compared with rifampin against Mycobacterium leprae in mice. Antimicrob Agents Chemother 31:134.
a, b Jamet P, Traore I, Husser JA, Ji B. 1992. Short-term trial of clofazimine in previously untreated lepromatous leprosy. Int J Lepr Other Mycobact Dis 60:542–548. a, b Ji B, Perani EG, Petinom C, N’Deli L, Grosset JH. 1994. Clinical trial of ofloxacin alone and in combination with dapsone plus clofazimine for treatment of lepromatous leprosy. Antimicrob Agents Chemother 38:662–667. ^ Morrison NE, Marley GM. 1976. Clofazimine binding studies with deoxyribonucleic acid. Int J Lepr Other Mycobact Dis 44:475–481. ^ De Bruyn EE, Steel HC, Van Rensburg EJ, Anderson R. 1996. The riminophenazines, clofazimine and B669, inhibit potassium transport in gram-positive bacteria by a lysophospholipid-dependent mechanism. J Antimicrob Chemother 38:349–362. ^ Barrett DF. 1976. Lepromatous leprosy: dapsone resistance. Proc R Soc Med 69:391–392. ^ Cartel JL, Boutin JP, Plichart R, Roux J, Grosset JH. 1988. [Leprosy in the French Polynesian archipelagoes from 1967 to 1987]. Bull Soc Pathol Exot Filiales 81:819–826. ^ Hooper DC. 2000. Mechanisms of action and resistance of older and newer fluoroquinolones. Clin Infect Dis 31 Suppl 2:S24–28. ^ Matrat S, Petrella S, Cambau E, Sougakoff W, Jarlier V, Aubry A. 2007. Expression and purification of an active form of the Mycobacterium leprae DNA gyrase and its inhibition by quinolones. Antimicrob Agents Chemother 51:1643–1648. ^ Traore I, Ji B, Lienhardt C, Bobin P, Grosset J. 1996. Determination of the minimal effective dosages of ofloxacin and sparfloxacin against M. leprae in the mouse foot pad system. Int J Lepr Other Mycobact Dis 64:142–145. a, b Ji B, Grosset J. 2000. Combination of rifapentine-moxifloxacin-minocycline (PMM) for the treatment of leprosy. Lepr Rev 71 Suppl:S81–87. ^ Pardillo FE, Burgos J, Fajardo TT, Dela Cruz E, Abalos RM, Paredes RM, Andaya CE, Gelber RH. 2008. Powerful bactericidal activity of moxifloxacin in human leprosy. Antimicrob Agents Chemother 52:3113–3117. ^ Gomez C, Ponien P, Serradji N, Lamouri A, Pantel A, Capton E, Jarlier V, Anquetin G, Aubry A. 2013. Synthesis of gatifloxacin derivatives and their biological activities against Mycobacterium leprae and Mycobacterium tuberculosis. Bioorg Med Chem 21:948–956. ^ Sturgill MG, Rapp RP. 1992. Clarithromycin: review of a new macrolide antibiotic with improved microbiologic spectrum and favorable pharmacokinetic and adverse effect profiles. Ann Pharmacother 26:1099–1108. a, b Ji B, Perani EG, Grosset JH. 1991. Effectiveness of clarithromycin and minocycline alone and in combination against experimental Mycobacterium leprae infection in mice. Antimicrob Agents Chemother 35:579–581. ^ Franzblau SG, Hastings RC. 1988. In vitro and in vivo activities of macrolides against Mycobacterium leprae. Antimicrob Agents Chemother 32:1758–1762. ^ Gelber RH, Siu P, Tsang M, Murray LP. 1991. Activities of various macrolide antibiotics against Mycobacterium leprae infection in mice. Antimicrob Agents Chemother 35:760–763. a, b Ji B, Jamet P, Perani EG, Bobin P, Grosset JH. 1993. Powerful bactericidal activities of clarithromycin and minocycline against Mycobacterium leprae in lepromatous leprosy. J Infect Dis 168:188–190. ^ Chan GP, Garcia-Ignacio BY, Chavez VE, Livelo JB, Jimenez CL, Parrilla ML, Franzblau SG. 1994. Clinical trial of clarithromycin for lepromatous leprosy. Antimicrob Agents Chemother 38:515–517. a, b Meier A, Heifets L, Wallace RJ, Jr., Zhang Y, Brown BA, Sander P, Bottger EC. 1996. Molecular mechanisms of clarithromycin resistance in Mycobacterium avium: observation of multiple 23S rDNA mutations in a clonal population. J Infect Dis 174:354–360. a, b Gelber RH. 1987. Activity of minocycline in Mycobacterium leprae-infected mice. J Infect Dis 156:236–239. a, b Taylor DE, Chau A. 1996. Tetracycline resistance mediated by ribosomal protection. Antimicrob Agents Chemother 40:1–5. a, b Ji B, Grosset JH. 1990. Recent advances in the chemotherapy of leprosy. Lepr Rev 61:313–329. ^ Ji B, Jamet P, Perani EG, Sow S, Lienhardt C, Petinon C, Grosset JH. 1996. Bactericidal activity of single dose of clarithromycin plus minocycline, with or without ofloxacin, against Mycobacterium leprae in patients. Antimicrob Agents Chemother 40:2137–2141. ^ Setia MS, Shinde SS, Jerajani HR, Boivin JF. 2011. Is there a role for rifampicin, ofloxacin and minocycline (ROM) therapy in the treatment of leprosy? Systematic review and meta-analysis. Trop Med Int Health 16:1541–1551. a, b Wang F, Langley R, Gulten G, Dover LG, Besra GS, Jacobs WR, Jr., Sacchettini JC. 2007. Mechanism of thioamide drug action against tuberculosis and leprosy. J Exp Med 204:73–78. ^ Fajardo TT, Guinto RS, Cellona RV, Abalos RM, Dela Cruz EC, Gelber RH. 2006. A clinical trial of ethionamide and prothionamide for treatment of lepromatous leprosy. Am J Trop Med Hyg 74:457–461. ^ Gelber RH. 1987. Further studies of the killing of M. leprae by aminoglycosides: reduced dosage and frequency of administration. Int J Lepr Other Mycobact Dis 55:78–82. ^ Franzblau SG, Chan GP, Garcia-Ignacio BG, Chavez VE, Livelo JB, Jimenez CL, Parrilla ML, Calvo RF, Williams DL, Gillis TP. 1994. Clinical trial of fusidic acid for lepromatous leprosy. Antimicrob Agents Chemother 38:1651–1654. a, b Gelber RH. 1984. Activity of cycloserine and structurally related compounds against M. leprae-infected mice. Int J Lepr Other Mycobact Dis 52:536–538. a, b Gelber RH. 1991. The activity of amoxicillin plus clavulanic acid against Mycobacterium leprae in mice. J Infect Dis 163:1374–1377. ^ Franzblau SG. 1991. In vitro activities of aminoglycosides, lincosamides, and rifamycins against Mycobacterium leprae. Antimicrob Agents Chemother 35:1232–1234. ^ Grosset JH, Cole ST. 2001. Genomics and the chemotherapy of leprosy. Lepr Rev 72:429–440. ^ Andries K, Verhasselt P, Guillemont J, Gohlmann HW, Neefs JM, Winkler H, Van Gestel J, Timmerman P, Zhu M, Lee E, Williams P, de Chaffoy D, Huitric E, Hoffner S, Cambau E, Truffot-Pernot C, Lounis N, Jarlier V. 2005. A diarylquinoline drug active on the ATP synthase of Mycobacterium tuberculosis. Science 307:223–227. a, b, c Ji B, Chauffour A, Andries K, Jarlier V. 2006. Bactericidal activities of R207910 and other newer antimicrobial agents against Mycobacterium leprae in mice. Antimicrob Agents Chemother 50:1558–1560. ^ Gelber R, Andries K, Paredes RM, Andaya CE, Burgos J. 2009. The diarylquinoline R207910 is bactericidal against Mycobacterium leprae in mice at low dose and administered intermittently. Antimicrob Agents Chemother 53:3989–3991. ^ Burgos J, de la Cruz E, Paredes R, Andaya CR, Gelber RH. 2011. The activity of several newer antimicrobials against logarithmically multiplying M. leprae in mice. Lepr Rev 82:253–258. ^ Manjunatha UH, Lahiri R, Randhawa B, Dowd CS, Krahenbuhl JL, Barry CE, 3rd. 2006. Mycobacterium leprae is naturally resistant to PA-824. Antimicrob Agents Chemother 50:3350–3354. ^ Dhople AM. 2002. In vivo activity of epiroprim, a dihydrofolate reductase inhibitor, singly and in combination with dapsone, against Mycobacterium leprae. Int J Antimicrob Agents 19:71–74. ^ Guelpa-Lauras C, Cartel J, Constant-Desportes M, Millan J, Bobin P, Guidi C, Brucker G, Flageul B, Guillaume J, Pichet C, Remy J, Grosset J. 1987. Primary and secondary dapsone resistance of M. leprae in Martinique, Guadeloupe, New Caledonia, Tahiti, Senegal, and Paris between 1980 and 1985. International Journal of Leprosy 55:672–679. ^ Pearson JM, Cap JA, Haile GS, Rees RJ. 1977. Dapsone-resistant leprosy and its implications for leprosy control programmes. Lepr Rev 48:83–94. ^ Grosset J, Guelpa-Lauras C, Bobin P. 1989. Study of 39 documented relapses of multibacillary leprosy after treatment with rifampin. International Journal of Leprosy 57:607–614. ^ Baca AM, Sirawaraporn R, Turley S, Sirawaraporn W, Hol WG. 2000. Crystal structure of Mycobacterium tuberculosis 7,8-dihydropteroate synthase in complex with pterin monophosphate: new insight into the enzymatic mechanism and sulfa-drug action. J Mol Biol 302:1193–1212. a, b Gillis TP, Williams DL. 2000. Dapsone resistance in Mycobacterium leprae. Lepr Rev 71 Suppl:S91–95. ^ Gillis TP, Williams DL. 1999. Dapsone resistance does not appear to be associated with a mutation in the dihydropteroate synthase-2 gene of Mycobacterium leprae. Indian J Lepr 71:11–18. a, b, c, d, e, f, g Cambau E, Carthagena L, Chauffour A, Ji B, Jarlier V. 2006. Dihydropteroate synthase mutations in the folP1 gene predict dapsone resistance in relapsed cases of leprosy. Clin Infect Dis 42:238–241. a, b, c, d Kai M, Matsuoka M, Nakata N, Maeda S, Gidoh M, Maeda Y, Hashimoto K, Kobayashi K, Kashiwabara Y. 1999. Diaminodiphenylsulfone resistance of Mycobacterium leprae due to mutations in the dihydropteroate synthase gene. FEMS Microbiology Letters 177:231–235. a, b, c, d, e Williams DL, Pittman TL, Gillis TP, Matsuoka M, Kashiwabara Y. 2001. Simultaneous detection of Mycobacterium leprae and its susceptibility to dapsone using DNA heteroduplex analysis. J Clin Microbiol 39:2083–2088. a, b, c, d, e, f, g, h, i, j, k Maeda S, Matsuoka M, Nakata N, Kai M, Maeda Y, Hashimoto K, Kimura H, Kobayashi K, Kashiwabara Y. 2001. Multidrug resistant Mycobacterium leprae from patients with leprosy. Antimicrob Agents Chemother 45:3635–3639. a, b, c, d, e, f Cambau E, Chauffour-Nevejans A, Tejmar-Kolar L, Matsuoka M, Jarlier V. 2012. Detection of antibiotic resistance in leprosy using GenoType LepraeDR, a novel ready-to-use molecular test. PLoS Negl Trop Dis 6:e1739. a, b, c Matsuoka M, Budiawan T, Aye KS, Kyaw K, Tan EV, Cruz ED, Gelber R, Saunderson P, Balagon V, Pannikar V. 2007. The frequency of drug resistance mutations in Mycobacterium leprae isolates in untreated and relapsed leprosy patients from Myanmar, Indonesia and the Philippines. Lepr Rev 78:343–352. a, b, c Matsuoka M. 2010. Drug resistance in leprosy. Jpn J Infect Dis 63:1–7. a, b, c, d, e Cambau E, Bonnafous P, Perani E, Sougakoff W, Ji B, Jarlier V. 2002. Molecular detection of rifampin and ofloxacin resistance for patients who experience relapse of multibacillary leprosy. Clin Infect Dis 34:39–45. a, b, c, d, e, f, g, h, i Honore N, Cole ST. 1993. Molecular basis of rifampin resistance in Mycobacterium leprae. Antimicrob Agents Chemother 37:414–418. a, b Williams DL, Waguespack C, Eisenach K, Crawford JT, Portaels F, Salfinger M, Nolan CM, Abe C, Sticht-Groh V, Gillis TP. 1994. Characterization of rifampin-resistance in pathogenic mycobacteria. Antimicrob Agents Chemother 38:2380–2386. ^ Nakata N, Kai M, Makino M. 2011. Mutation analysis of the Mycobacterium leprae folP1 gene and dapsone resistance. Antimicrob Agents Chemother 55:762–766. ^ Chaitanya VS, Das M, Bhat P, Ebenezer M. 2015. Computational Modelling of Dapsone Interaction With Dihydropteroate Synthase in Mycobacterium leprae; Insights Into Molecular Basis of Dapsone Resistance in Leprosy. J Cell Biochem 116:2293–2303. ^ Honore N, Roche PW, Grosset JH, Cole ST. 2001. A method for rapid detection of rifampicin-resistant isolates of Mycobacterium leprae. Lepr Rev 72:441–448. a, b Cole S, Eiglmeier K, Parkhill J, James K, Thomson N, Wheeler P, Honore N, Garnier T, Churcher G. 2001. Massive gene decay in the leprosy bacillus. Nature 409:1007–1011. ^ Andre E, Goeminne L, Cabibbe A, Beckert P, Kabamba Mukadi B, Mathys V, Gagneux S, Niemann S, Van Ingen J, Cambau E. 2017. Consensus numbering system for the rifampicin resistance-associated rpoB gene mutations in pathogenic mycobacteria. Clin Microbiol Infect 23:167–172. ^ Maruri F, Sterling TR, Kaiga AW, Blackman A, van der Heijden YF, Mayer C, Cambau E, Aubry A. 2012. A systematic review of gyrase mutations associated with fluoroquinolone-resistant Mycobacterium tuberculosis and a proposed gyrase numbering system. J Antimicrob Chemother 67:819–831. ^ Cambau E, Matrat S, Pan XS, Roth Dit Bettoni R, Corbel C, Aubry A, Lascols C, Driot JY, Fisher LM. 2009. Target specificity of the new fluoroquinolone besifloxacin in Streptococcus pneumoniae, Staphylococcus aureus and Escherichia coli. J Antimicrob Chemother 63:443–450. ^ Matsuoka M, Kashiwabara Y, Namisato M. 2000. A Mycobacterium leprae isolate resistant to dapsone, rifampin, ofloxacin and sparfloxacin. International Journal of Leprosy 68:452–455. a, b Rocha Ada S, Cunha M, Diniz LM, Salgado C, Aires MA, Nery JA, Gallo EN, Miranda A, Magnanini MM, Matsuoka M, Sarno EN, Suffys PN, de Oliveira ML. 2012. Drug and Multidrug Resistance among Mycobacterium leprae Isolates from Brazilian Relapsed Leprosy Patients. J Clin Microbiol 50:1912–1917. a, b Veziris N, Chauffour A, Escolano S, Henquet S, Matsuoka M, Jarlier V, Aubry A. 2013. Resistance of M. leprae to quinolones: a question of relativity? PLoS Negl Trop Dis 7:e2559. ^ Yokoyama K, Kim H, Mukai T, Matsuoka M, Nakajima C, Suzuki Y. 2012. Impact of amino acid substitutions in B subunit of DNA gyrase in Mycobacterium leprae on fluoroquinolone resistance. PLoS Negl Trop Dis 6:e1838. ^ Matrat S, Cambau E, Jarlier V, Aubry A. 2008. Are all the DNA gyrase mutations found in Mycobacterium leprae clinical strains involved in resistance to fluoroquinolones? Antimicrob Agents Chemother 52:745–747. ^ Vester B, Douthwaite S. 2001. Macrolide resistance conferred by base substitutions in 23S rRNA. Antimicrob Agents Chemother 45:1–12. ^ Hartkoorn RC, Uplekar S, Cole ST. 2014. Cross-resistance between clofazimine and bedaquiline through upregulation of MmpL5 in Mycobacterium tuberculosis. Antimicrob Agents Chemother 58:2979–2981. ^ Andries K, Villellas C, Coeck N, Thys K, Gevers T, Vranckx L, Lounis N, de Jong BC, Koul A. 2014. Acquired resistance of Mycobacterium tuberculosis to bedaquiline. PLoS One 9:e102135. ^ Zhang S, Chen J, Cui P, Shi W, Zhang W, Zhang Y. 2015. Identification of novel mutations associated with clofazimine resistance in Mycobacterium tuberculosis. J Antimicrob Chemother 70:2507–2510. ^ Shepard CC, Chang YT. 1962. Effect of several anti-leprosy drugs on multiplication of human leprosy bacilli in footpads of mice. Proc Soc Exp Biol Med 109:636–638. ^ Franzblau SG. 1989. Drug susceptibility testing of Mycobacterium leprae in the BACTEC 460 system. Antimicrob Agents Chemother 33:2115–2117. ^ Eiglmeier K, Honore N, Woods SA, Caudron B, Cole ST. 1993. Use of an ordered cosmid library to deduce the genomic organization of Mycobacterium leprae. Mol Microbiol 7:197–206. ^ Fsihi H, De Rossi E, Salazar L, Cantoni R, Labo M, Riccardi G, Takiff HE, Eiglmeier K, Bergh S, Cole ST. 1996. Gene arrangement and organization in a approximately 76 kb fragment encompassing the oriC region of the chromosome of Mycobacterium leprae. Microbiology 142 (Pt 11):3147–3161. ^ Cole ST, Brosch R, Parkhill J, Garnier T, Churcher C, Harris D, Gordon SV, Eiglmeier K, Gas S, Barry CE, 3rd, Tekaia F, Badcock K, Basham D, Brown D, Chillingworth T, Connor R, Davies R, Devlin K, Feltwell T, Gentles S, Hamlin N, Holroyd S, Hornsby T, Jagels K, Krogh A, McLean J, Moule S, Murphy L, Oliver K, Osborne J, Quail MA, Rajandream MA, Rogers J, Rutter S, Seeger K, Skelton J, Squares R, Squares S, Sulston JE, Taylor K, Whitehead S, Barrell BG. 1998. Deciphering the biology of Mycobacterium tuberculosis from the complete genome sequence. Nature 393:537–544. a, b WHO. 2009. Guidelines for global surveillance of drug resistance in leprosy. WHO, India. a, b Li W, Matsuoka M, Kai M, Thapa P, Khadge S, Hagge DA, Brennan PJ, Vissa V. 2012. Real-time PCR and high-resolution melt analysis for rapid detection of Mycobacterium leprae drug resistance mutations and strain types. J Clin Microbiol 50:742–753. ^ Williams DL, Gillis TP. 2012. Drug-resistant leprosy: monitoring and current status. Lepr Rev 83:269–281. a, b, c Araujo S, Goulart LR, Truman RW, Goulart IMB, Vissa V, Li W, Matsuoka M, Suffys P, Fontes AB, Rosa PS, Scollard DM, Williams DL. 2017. qPCR-High resolution melt analysis for drug susceptibility testing of Mycobacterium leprae directly from clinical specimens of leprosy patients. PLoS Negl Trop Dis 11:e0005506. ^ Matsuoka M, Aye KS, Kyaw K, Tan EV, Balagon MV, Saunderson P, Gelber R, Makino M, Nakajima C, Suzuki Y. 2008. A novel method for simple detection of mutations conferring drug resistance in Mycobacterium leprae, based on a DNA microarray, and its applicability in developing countries. J Med Microbiol 57:1213–1219. ^ Ji B. 2002. Rifampicin resistant leprosy: a review and a research proposal of a pilot study. Lepr Rev 73:2–8. ^ Cambau E, Saunderson P, Matsuoka M, Cole ST, Kai M, Suffys P, Rosa PS, Williams D, Gupta UD, Lavania M, Cardona-Castro N, Miyamoto Y, Hagge D, Srikantam A, Hongseng W, Indropo A, Vissa V, Johnson RC, Cauchoix B, Pannikar VK, Cooreman EAWD, Pemmaraju VRR, Gillini L. 2018. Antimicrobial resistance in leprosy: results of the first prospective open survey conducted by a WHO surveillance network for the period 2009–15. Clin Microbiol Infect. doi: 10.1016/j.cmi.2018.02.022. ^ WHO. 2010. Surveillance of drug resistance in leprosy: 2009. Weekly epidemiological record (WER) 85:281–284.